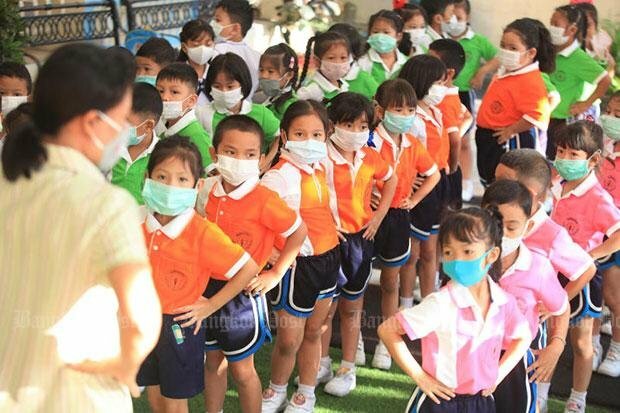 Air pollution has forced the closure of all 437 schools run by Bangkok's City Hall until next week, while other public and private schools in Bangkok and surrounding provinces will be closed on Thursday and Friday. Bangkok governor Aswin Kwanmuang on Wednesday ordered the suspension of classes at all 437 schools under the Bangkok Metropolitan Administration, starting from noon today. He designated Jan 31 and Feb 1 as holidays to help protect students from the current high levels of harmful ultra-fine dust particles, and also to reduce the use of private cars by parents. Maybe I could get one of these on eBay. Even made the BBC world news now. And while closing the schools right now is a good idea, it's overlooking the fact that today is PAYDAY. Most Thais are going to be out driving the city in a mad panic to spend their money as fast as they can. Bangkok is preparing to launch 50 drones tomorrow for spraying water in the skies over the capital. The water will contain molasses to aid in the attachment to smog particles. The Thai News Agency is reporting that Bangkok Governor Aswin Kwanmuang says they have contacted a drone club in Nakhon Ratchasima to get 50 drones which can carry 10 litres of water each to fly over Bangkok. The water will contain molasses which and is predicted to help relieve the smog problem. Scientists say that the molasses will assist in the trapping of smog and cause it to fall onto the ground as black drops (great result if you happen to be walking underneath at the time). Water trucks are being prepared to clean roads and vehicles which might be affected tomorrow. I wonder why they are not anchoring ships in the river and running their engines at 1/2 ahead? Doesn't that get rid of stuff? "According to a one-year average level of PM2.5 from all 25 PCD monitoring stations in 18 provinces, the five cities with the worst air pollution were Saraburi (36 micrograms per cubic metre of air), Bangkok (31), Samut Sakhon (29), Ratchaburi (25) and Chiang Mai (29). The WHO standard was less than 10 micrograms." Make Songkran different this year. Throw molasses at each other! i know, pedantic Engineer haha.